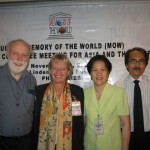 Newly elected (November 2005) Bureau members of MOWCAP : Left to right : Mr. Ray Edmondson (chair, Australia), Dr Susanne Ornager (Ex-officio, UNESCO Regional Advisor), Ms Carmen Padilla (vice-chair, Philippines), Mr Simon F.K. Chu (Secretary General, Hong Kong). 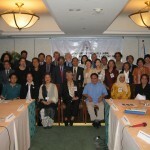 Participants of the Second MOWCAP General Meeting, 7-9 November 2005, Manila, Phillipines.